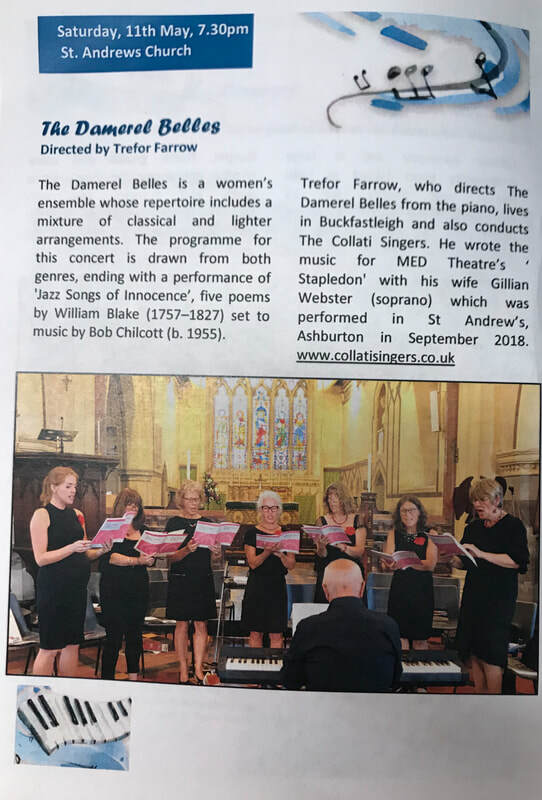 The Damerel Belles is a small ensemble of women who either sing in Collati or have sung with Trefor in various other choirs over the years, who meet to do concerts on an occasional basis. Their repertoire includes a mixture of classical and lighter arrangements. Members come from Plymouth, Dartmouth, Kingsbridge, Ivybridge and Buckfastleigh. The name The Damerel Belles originated since their rehearsals in Stoke Damerel Church in Plymouth were often 'complemented' by the bell ringers rehearsing on the same evening, and prompted a change of rehearsal venue! NEXT CONCERT! Saturday 11th May in St Andrew's Church, Ashburton at 7.30pm, as part of the Ashburton Choirs Festival (non-competitive!) when The Damerel Belles will be performing in the first half, with the second half of the evening featuring The Big Noise Chorus. In this concert The Damerel Belles will be conducted from the piano by Trefor Farrow, and will be singing a programme drawn from both the classical and lighter genres, including pieces by Purcell and Willcox alongside some classic jazz standards,ending with a performance of 'Jazz Songs of Innocence' by Bob Chilcott, a setting of five poems by William Blake. Tickets £6 (£2 under 15) from choir members, from Ashburton Information Centre or contact collatisingers@gmail.com. There may be tickets on the door if there are any remaining. plus: Gemma Hall and Janet Hooper ​(not pictured).